With decorative interior painting and the right use of contrast, color and pattern, you can easily add some "WOW" to a plain foyer, bring the (seemingly endless) wall expanse under control and make the whole area look more inviting. 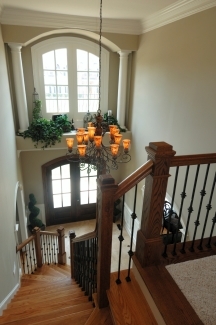 A foyer is meant to be spectacular. It is the first room people see when they enter your home, it sets the tone and expectations for the rest of your house and tells a lot about your style, taste and even personality (or lack thereof). But most people struggle with decorating their foyers - the walls are just too large and tall to look welcoming! They use furniture, pictures, mirrors and many other decorative pieces trying to fill all the empty wall space and make it look less overwhelming, but the result is often a room that looks cluttered yet still feels somehow unfinished and cold. 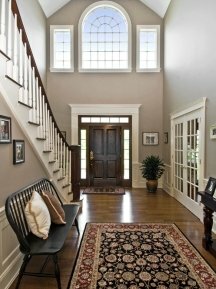 Do you have the same challenge with your foyer? Then pay attention to the following suggestions, because with decorative interior painting you can finally solve the problem of "too much walls" and add that little something that often seems to be missing in the foyer decor. In decorative interior painting, contrast is a very useful tool whenever you need to make an XL room appear friendlier or smaller. With contrast, you can bring the walls in, divide one open area into different parts, and break oversized wall planes into more manageable sections. 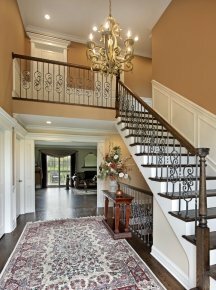 So if your foyer looks too large or the wall space too overwhelming, you need to create more contrast between the wall color, ceiling, trim and other elements in the design and construction (staircase, wainscoting, alcoves, chair rail, flooring, etc). And contrast is especially important when there is little or no interesting architectural detail in your foyer, because it's what creates some interest in a boxy space, and distracts from the huge flat wall expanse. When the contrast is too low in a plain foyer, everything just blends into one continuum and makes the walls look even bigger and more disproportionate than they already are. But a contrasting color will turn even ordinary doors, windows and basic trim into decorative elements, and make them stand out, adding definition to the walls that looked absolutely bland and boring before. Some contrasting elements (doors, windows, niches and nooks, etc) will "use up" and fill a bit of the wall space so that it no longer looks bare, while others (chair rail, wainscoting, etc) will also divide it so that it appears more balanced and/or reasonably scaled. The result will be a clean, yet finished look with no unnecessary clutter on the walls. Note that the higher the contrast, the more dramatic and minimizing the effect, but don't think in terms of black and white. To cozy up an oversized foyer you just need to create enough visual separation between the elements to interrupt the monotony of the tall space, direct the eye to where you want it to go, and give it something to stop and rest on at comfortable intervals. 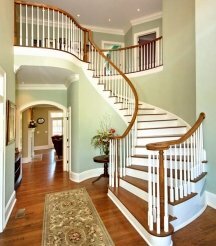 Color is another way to make a large and cold foyer look cozier without cluttering the space. In fact, some mid-tones and deep shades can even completely eliminate the need for any extra decorations. It's because rich paint colors make the walls look "filled", and when paired with contrasting trim and woodwork, the combination often creates enough interest and variation to make the room look finished, with no other "stuff" needed. But should you still choose to add some wall decor, you will often find that you don't need as many pieces as you thought you did before painting. In addition to warming up the space and creating an atmosphere (both very easily done with color, and the possibilities are endless), the right color will also pull everything together, and make all the elements in the decor look connected. A wrong wall color will only clash with your decor, compete with the other elements for attention and just generally take away instead of enhancing - it's because every piece of furniture and every accent needs the right color background to look right, and because something must be the star of the show, and some things should play a supporting, secondary, quieter role. Fortunately, whenever your decor looks busy, disjointed or just plain wrong, the problem can often be solved easily by simply changing the wall color. So spend the most time on choosing the paint color for the walls because that's what will make decorating your foyer a much faster and less frustrating process. And just like contrast, color can be used effectively to section off one large area into smaller parts (by strategically using 2 or even 3 different colors for painting different walls). 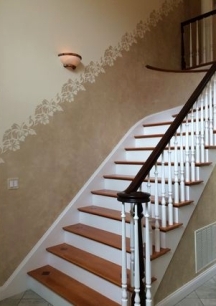 In decorative interior painting, the right color and sufficient contrast can usually solve most challenges, including those that come with painting and decorating large foyer walls. But there are situations where it takes a little extra help to tame an oversized wall expanse (especially in very plain foyers with minimal trimwork and few doors or windows to break up the surface). Besides, beauty is subjective and what looks complete to one person may still look unfinished to another. That's when faux finishes can add the missing link with a 1-2-3 punch: they will fragment, fill and decorate the surfaces all at the same time. Their structured or free-form patterns will make the walls look impressive, but no longer overwhelming, and depending on the color combinations, contrast level and technique you use, faux finishes can work in any home decorating style - from contemporary to traditional and everything in between. It's even possible to create the cozy, familiar and comfortable wallpaper effect without the hassle of installing the real thing, or imitate chair rail, wainscoting or other elaborate trimwork as an alternative to calling a carpenter. 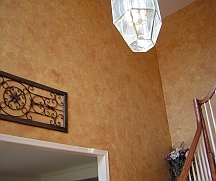 Glazing, color washing, stamping and stenciling are the most popular "faux" techniques in decorative interior painting and just a few of the possibilities that, when skillfully done, will turn even the most ordinary foyer into a showroom and guarantee the most favorable first impression. Popcorn Ceiling Texture: Apply, Paint, Repair or Remove?